Mid-November brought us a strong market crash that shook up the prices, many of which hadn’t significantly moved in months, and the market is showing no signs of recovery yet. 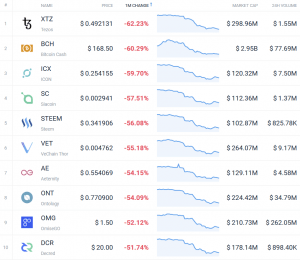 Out of the top 10 coins, only two were in green, and one of them is a stablecoin. 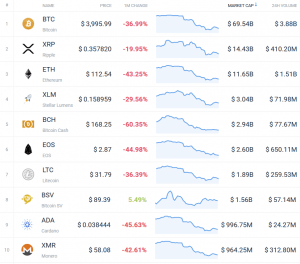 Of the others among top 50 coins by market capitalization, all have lost around 20% or more in the past month. Source: Coincodex, December 1, UTC 07:00 AM. That the bears made November their month is obvious, but exactly how much damage they’re leaving behind can best be seen through our monthly winners/losers overview. As we generally don’t include stablecoins in any of the categories - as their price is not supposed to be volatile - this list actually only contains two coins in green: Factom (FCT) and Bitcoin SV (BSV). 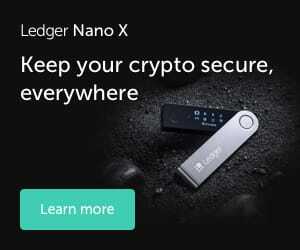 The price surge of FCT seems to come after news that its Harmony blockchain-as-a-service (BaaS) technology is to be used by mortgage software and marketing firm, Equator, as a way to increase efficiency. Bitcoin SV, meanwhile, is a complete newcomer, spawned from the Bitcoin Cash hard fork, and continues its upward trek in spite of other market conditions, with a net increase of around 5%. The third-best coin (where “best” is certainly a bit of a stretch) is XEM with a loss of 17%. 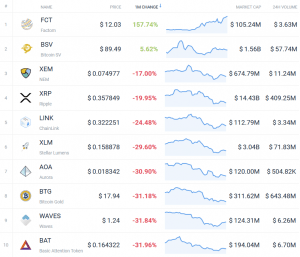 The Basic Attention Token (BAT) is the lowest on the list with a loss of almost 32%. BAT was a winner last month as well, but with in a significant plus, with an increase of more than 40% back then. The list shares some other winners with October as well. Another example is ChainLink (LINK) that now lost around a quarter of its initial value, whereas it had gained around 60% previously, and Aurora (AOA) with a 30% loss. The biggest loser this month was Tezos (XTZ) with a loss of more than 60%, closely followed by Bitcoin Cash (BCH) - also on the October losing list - and ICON (ICX). The only other member of the list shared among October and November is VeChain (VET). Perhaps surprisingly, October and November also share Aeternity (AE), but it was among the winners past month, whereas now it’s on the losing list. The biggest tumble in October happened to Bytecoin (BCN) at around 44%. This month, the least of the losers lost more than 50% - which goes to show what a bloodbath November was. In the top 100, Factom remains the biggest winner, but the list is much greener than in the top 50 as FCT and BSV are joined by ODEM (ODEM), Bitcoin Private (BTCP), QASH (QASH), Gemera (GEMA) and DEX (DEX), as the latter two have come back to the price they had in the beginning of the month. In the top 200, FCT is overtaken by Nasdacoin (NSD) which saw an increase of more than 400%, and the total number of green coins grows to 20 excluding stablecoins. The losing list moves Tezos to the fourth spot, as Metaverse ETP (ETP), Waltonchain (WTC) and Aion (AION) take the first three spots respectively. Another three coins join the top ranks in the top 200, where Optimal Shelf Availability Token (OSA) sits at the first spot with around 85% lost.